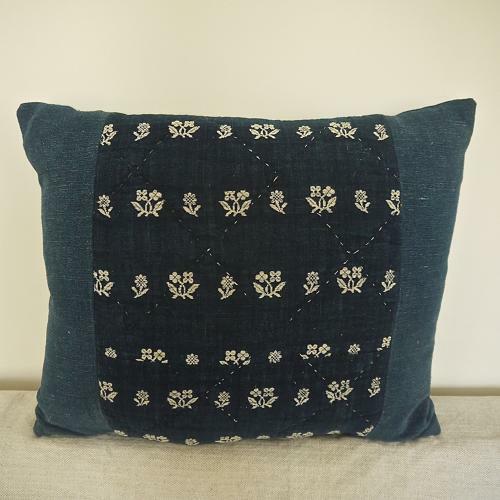 Late 18th century French wool woven on indigo linen cushion.Rare to find this textile,also called cambresene , on an indigo ground, usually the motif is on a white linen.Cushion quilted with a diamond pattern.Bordered and backed in a natural hand dyed 19th century french linen.Slip-stitched closed with a duck feather insert. An original seamed join going across the quilted part of the cushion approx 25cm down from the top. Some quilted stitches missing, otherwise in very good condition.